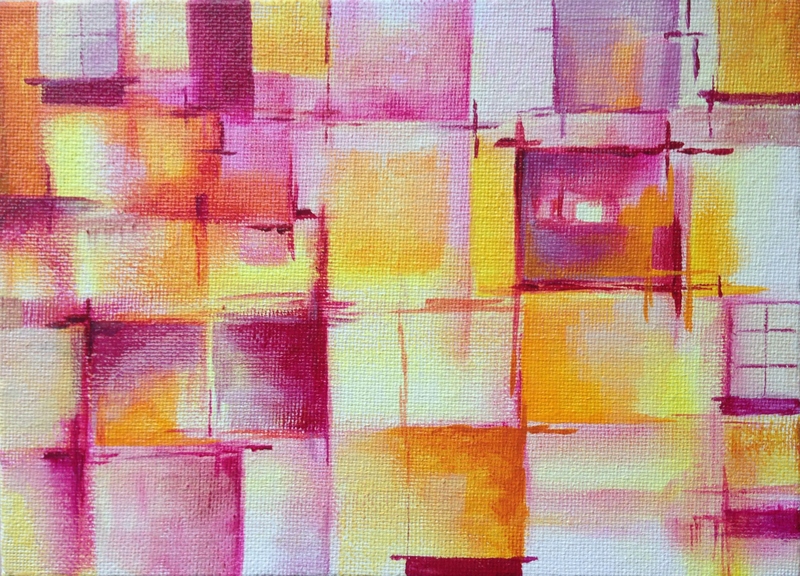 Summer Glow: Abstract Acrylic as May Madness Continues! I was out with a bug that had me down for days, but I’m starting to revive. I had a little time to paint last night, and really enjoyed it. I’ve been missing it! This was my first time painting on Blick’s line of cotton canvas panels. This one was part of a 5-pack of 5×7″ panels that sells for $4.31 currently. Seemed like a pretty good deal to me, so I snagged it. I was really happy with the quality of this surface! The only other I’ve tried I bought on sale at JoAnn’s, and that one I would not recommend, as there were obvious flaws in the canvas that I did not really notice until it was painted. The Blick canvas was flaw free, sturdy, double-primed, and was a joy to paint on, so two thumbs up for Blick! (Now that I am a Blick affiliate, I have to mention that I may receive a small percentage of purchases made through this link – but honestly, it wouldn’t change what I’m saying one bit, as I’ve been singing Blick’s praises since I started creating art nearly two years ago.) Has anyone else had experience with these panels? I’d love to get your thoughts, as this was only my first one, and I’m thinking of stocking up! I keep coming back to quinacridone magenta and hansa yellow light, and just loving these shades together. I’ve included indian yellow hue, quinacridone crimson, quinacridone violet, cobalt violet hue and a new color I’m really loving: diarylide yellow (all by Golden). Has anyone tried this color? It reads like a vibrant, cheery yellow-orange. Love it! It really zipped up the happy in this piece, I think. It helped me communicate the joy I feel to be painting again! So it’s a new favorite for me. Remembering all those who have served and passed, like my dad, a proud Navy veteran. I want to thank our men and women in uniform who continue to serve and protect our freedoms today. Peace to all. Glad you’re getting over your bug, and those cheerful colors really do have a glow about them. I have to ponder over the squares a bit and wonder if it’s symbolic of “putting things back together” in some way. Or then again, I see lots of windows, expressing lots of ways of looking out on the world. Amazing how much can be said with “non-representational” art. It can be so much more expressive than realism. Thanks, Judith! I’ve been working on a series of “window” paintings and this is kind of a subset of that – at least, to my mind. I totally agree, abstract art is way more expressive, at least the way I make it. Golden acrylics really do glow. They are a bit more expensive, but IMO they are actually worth it. I would say those and Neocolors are both worth the extra charged by the brand name, having used both the name brand and off brands in those products. Being in the numbers business, I watch my spending, but those two things are worth it. And Arches paper! Can’t forget that. Glad you enjoyed it. It’s nice to be feeling better again! It’s amazing to see all the different paints and crayons available. If only we could try them all! There’s just so much out there, and each medium offers so many possibilities. No way anyone could ever get tired of doing art. 🙂 There’s always something new. I think this is what I love the most, Judith. You have nailed it right here! Thank you. Boy, we could all say Amen to that! GORGEOUS Loo! So glad to see you back! Glad you are feeling better. These are becoming your signature colors and style – love it! This almost looks like watercolor the way it blends! This is so bright and cheerful and Laura Looey! Would be beautiful in a grouping! Can you paint with watercolor on these panels? Thanks so much, Jodi! I’m pretty sure these panels were designed for oils and acrylics, but I should try wc and see, who knows, I’ve done stranger experiments for sure lol. This is pretty much canvas on a panel vs. on stretcher bars. I’ve not heard of people painting w/wc on canvas….actually, now I think about it, I think the acrylic gesso most canvases and panels are primed with would act as a resist to wc paint. But for example, you could take light molding paste by Golden and texture that on this surface and then bam, you’ve turned it into a surface that’s absorbent for both wc and acrylics. And you could create cool textures with the light molding paste too, bonus! So if that’s the effect you were after, would work for that. I should try it and post! Oh do try! Sounds exciting! Yay! You’re back! So thrilled to know you’re feeling better, sis! 💕 And magenta and yellow is back too, which just makes me smile really big. I’m a huge fan of that combo too and this is a gorgeous piece. You just have to feel good when you see it. So full of energy and joy! Thanks so much, Charlie! What a combo, just love it, and throw in that gorgeous bright yellow-orange and BAM! Do you have a bright yellow-orange in your wc palette? I’d love to try this color in wc. I have winsor orange but it is definitely not as yellow as the diarylide yellow. So glad you enjoyed this! It was a blast to paint! I don’t have a single color that gets me to yellow orange… I typically mix my Azo Orange with Azo Yellow or Gamboge or even Quin Gold. It’s really transparent so you can get some interesting colors. Thanks so much, AE! It was lots of fun to create this one. I keep going back and forth when I look at this between cheerful and serene…perhaps it is simply both! Yay, sounds wonderful, Kathy! So glad you’re getting both vibes from this! Thanks! Thanks so much, Kirk! Does this remind you of the window paintings? It started out as one of those and took a slight turn. Still feels like an apt. building of windows to me. It does. I love the sharp delineations between the colors. Thanks! These are so much fun to do. I bet you’d have a blast with acrylics, Kirk! I’m still trying to figure out how to let watercolors run! Why am I so afraid of lots of water? I’ve just go to try it. Thanks, Laura. Well it can be messy and you may lose control but that’s what art is about. Have a rag handy lol. It definitely exudes a gorgeous summer glow! ❤ Sorry to hear you've been ill, Laura; I hope you'll be 100% better very soon. Good to see you back Laura. And, I love these window panes of joy, the colors you chose are so happy! My father was a Marine in WWII, we miss him! My dad was Navy, same war, Sharon. So proud of them all. Nice to hear about your father; I never knew that. Woo, a Marine, quite a proud thing that is all on its own! I’m so glad you like this painting! Are these your favorite colors? Thanks Laura, I do love these colors together. I like them all! ((((((Sharon)))))) yay! They’re some of my favorites too. I think each is more beautiful because of the influence of the others. I love the shape, the lines and the colors. Nice painting Laura. Very clean. I am a Blick canvas gal too. I have bought several hundred…probably almost 300 since December. I think they are good quality canvas and if you buy in bulk, the prices are really excellent. Oh, and pink and orange together are awesome. I love them together! Thank you! Thanks, Dawn, so glad you like this! This was done on one of those canvas panels, it’s probably 1/8″ thick. Do you use those, or just the wrapped canvases on stretcher bars? This is my first try on a Blick panel. I’m so glad you love their canvases because I have a feeling they will be my go-to once I use up the Utrecht clearance items I bought at Blick. Stretched canvas Blicks studio line 20+ quantity for EXCELLENT price. Good to see one of your paintings and you again! I have been missing you. Love this painting…the light and colors! Thank you, and I think you are totally right! At one point I thought it was finished, and then I decided to go back and add a few “windowsills” in in that darker color……but maybe that’s not enough. Do you think I need to add some orange with red to tie it together more plainly/better? Is it a size thing, a color thing, or a shape thing. Or all three? Thanks so much for your feedback, it means a lot. And glad to hear you’re taking it easy, Margaret. I hope you’re having a nice weekend. Okay after taking a look, originally it was a shape thing but then I see that your oranges and one spot of red are all in the upper left corner of your painting. To me, if you were to “intuitively” bring in just a touch of orange gravitating ever so slightly to your main window it might do that unifying job without having to bring out another window more. You know how that goes, trying to bring in more unifying shape or feeling and then make a conflict of interest. lol Ultimately you know what you want to convey in your painting but I am focusing on the lack of unity. 🙂 hope this helps. Thanks so much, Susan! This is where years of quilt making I think helped. Now I quilt with paint. Lol. Thanks, Tierney! Wouldn’t these colors make an amazing quilt with white? Great to hear you’re on the mend. And back with a bang – this colour partnership, and all the blends gathered here in their little windows, just brings a smile to the lips! Terrific abstract, love the glowing effect you get with the juxtaposition of your colors. Continue to feel better and thank you for sharing this gem. Just looking at this beautiful work would be enough to revive anyone else who is under the weather! I like this effect of this material, and the geometric design. Thanks so much! This was so much fun to do. The chances of Fun when working with acrylic paint are always good! I probably should be a little more experimental with my color combinations but I was really hoping that this would turn out and I thought these colors would give me a decent shot. So glad you enjoyed it! Thanks so much, Kerfe, I thought of you once this became (in my mind) a building in the city with its many windows. I always think of you when I’m playing with any type of grids! You were my inspiration for trying them. Glad you like the colors too. I’m kind of hooked on them for the moment! When summer starts cranking, I’ll be moving back to the cool colors lol. you are welcome. you are doing so great!!! Thanks! Are you glad May is over?! Thanks, Jill! Any constructive criticism? I’d love to hear!! You like that yellow-orange? I think I’ve fallen in love! Oh, yes! I love any color with orange in it! I was reading somewhere that when we add a contrasting color next to a color that it really makes it pop! Like blue next to orange for example. I wonder what that would do in your painting? Just a thought. Thanks Carrie! Is there anything you’d change about it to make it better? I feel I’m pretty good at color but not so great at composition lol! That’s a thought too! Thanks, Carrie! Wow, Denis! That’s a really interesting one. Could it be the influence of Memorial Day? Although that was passed when you commented, and do they even celebrate it in Oz? No we have Anzac Day to celebrate a defeat by Turkey in 1915 on 25/4 and all wars we have fought in and Remembrance Day on 11/11/to celebrate the end of WW1. I just saw an abstract of what the TV news throws up nightly from the Middle east. Nice painting 🙂 Glad you’re on the mend!